Jim McKeown has been building props for the film industry for over 20 years. 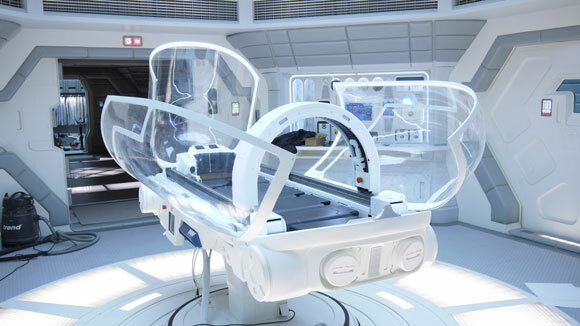 Recent work includes Hogwarts School for the Harry Potter films and Ridley Scott’s Med Pod for Prometheus. Whether it’s prop-making for feature films, creative solutions for interior designers or innovative stainless steel movie posters, Jim McKeown’s work incorporates a number of avenues with one defining quality – a wonderful imagination. This has enabled him to enjoy a career spanning over fifteen years working in film production. His unique talents in prop and model making, special effects and costume design have been utilised on a number of high profile films as well as in music video, television and the theatre. He’s worked with some of the industry’s most renowned filmmakers including Ridley Scott, Andrew Stanton, Joe Johnson, Danny Boyle and Sam Mendes, on films including Prometheus, John Carter, Captain America: The First Avenger, Sherlock, Wanted, Stardust, The Golden Compass, Casino Royale and Harry Potter. It is an enviable list of credits for a man who was stuck between deciding whether to major in music or art in high school. Luckily, for the films that have benefited from his unique and inventive approach to design and those audiences that have been thrilled by the realisation of such make-believe worlds, he chose art. Indeed, it was a pushy art teacher who sat him in a room with a phone and told him not to come out until he’d spoken to Wallace and Gromit animator and idol Nick Park. Jim was having to research an artist he admired for a project. As luck would have it, not only did he manage the feat with only the Yellow Pages to hand, he managed to talk his way into a luncheon meeting. At the time, during the mid-1990s, one of the biggest shows on British television was Spitting Image, a political satire involving puppets made to look like caricature versions of leading politicians. Jim set his sights on developing something inspired by the show and contacted Spitting Image creator Roger Law. Getting the opportunity to work in Law’s workshop, Jim sculpted, moulded and developed a puppet resembling television personality Bruce Forsythe. He admits he was very fortunate to have the opportunity to work with Law, but seized the opportunity, learning from the industry veteran and getting to work with some of the leading sculptors, model makers and animatronics technicians in Britain. Jim had a real thirst for the industry now. He had a foot firmly in the door and was eager to progress from television into film. “I have always loved watching films,” he tells me, remembering early childhood memories of watching Bond on the sofa with his family and making fruit salad with his Granddad whilst watching black and white Tarzan movies. The opportunity to transition to film came in 1997 when Working Title Films began production on The Borrowers. The fantasy-comedy, which starred John Goodman and Jim Broadbent, followed the exploits of a family of tiny (only six inches tall) “borrowers” who live in a house that is planned for demolition. Think Honey, I Shrunk the Kids with a British touch. 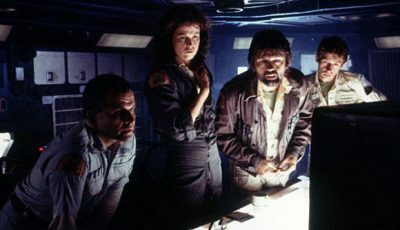 Jim was tasked to create the oversized props for in-camera effects as the actors interacted with them. This involved building an assortment of household items such as a six-foot tall walkie-talkie and an eighteen-inch paper clip. Jim’s big break came early in the 2000s when Warner Bros. began working on the Harry Potter films. Working directly for production on the Harry Potter model unit, Jim was part of the crew tasked with creating the colossal grandeur of gothic-tinged Hogwarts School where Harry Potter and his friends would do battle with the mighty Voldemort. “When I start on a film the art department give me either drawings or a storyboard, depending on what you are doing. The drawing could be anything from a model, hand prop, set dressing item, stunt prop, sculpture, jewellery to some other form of in-camera effect. Whatever has been envisaged and drawn has to be brought to life and look real,” Jim says of the process. If that sounds difficult consider that sometimes a prop maker will only be given hints as to what is required. This hint is delivered without any conceptual art meaning the filmmakers only know what they want when they see it. If it isn’t right, it is back to the workshop. 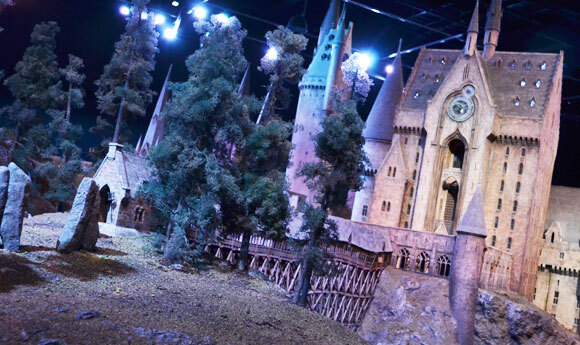 Of course, the piece Jim is asked about the most is the Hogwarts model for Harry Potter. Now that it is available for everyone to see at Warner Bros. Harry Potter Experience in London, the work Jim and a talented team of designers and artists worked many hours developing is exhibited in all its glory. “Harry Potter was my first real big budget feature film. I was still quite young and although I did know this was to be a big film, I never thought it would end up in a museum. Usually, everything we make ends up in storage for years or in the skip. “The build was about six months long. There were around thirty crew to start with. This increased as the deadline grew closer. There must have been sixty to seventy model makers by the end and then on top of that the painters, like ants all over it. “The surface area of Hogwarts is vast and each process of colours and washes to make it look as it does is quite a task. The whole model is made from steel, plaster, resin, MDF, pine, polystyrene, sweat and tears. 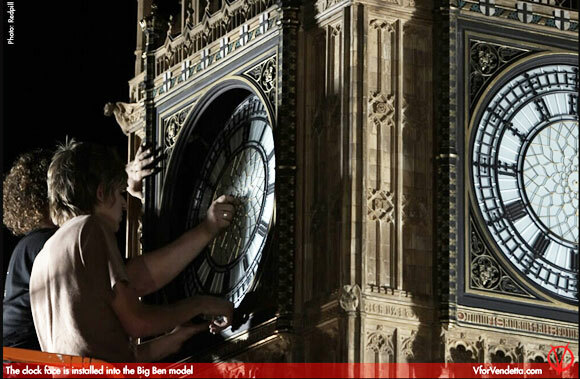 “As the shoot date was getting closer it was only then that the lighting of the model came up. Three of us had to put in an amazing number of fibre optics to light flambeaus to highlight rooms in and around the whole castle. Each room was accessible with some having to be tunnelled through solid polystyrene. From the front boathouse and up the stairs was the most interesting. There was a massive amount of polystyrene under that rock facade which had to be tunnelled through to receive fibre optic cables to power those flambeaus. 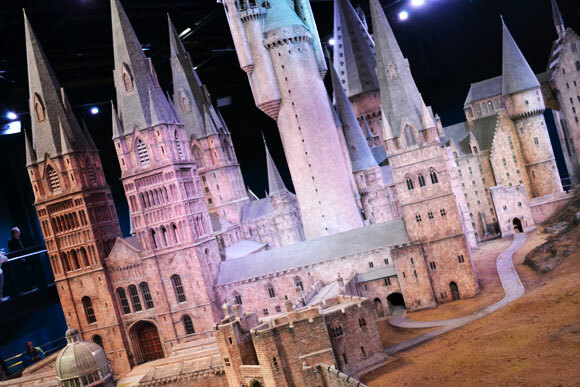 I can attest to the fact the Hogwarts model is a mightily impressive piece of work. On a recent visit to Warner Bros. Studios I was able to look at this 1:24 scale model up close and personal. The level of detail is indeed astonishing. It is even more striking because the minutest details are so authentically realised. Fleeting moments of film capture Hogwarts school, with added computer-generated imagery to bring out further detail, its life-like splendour a fully enveloping and believable presence. 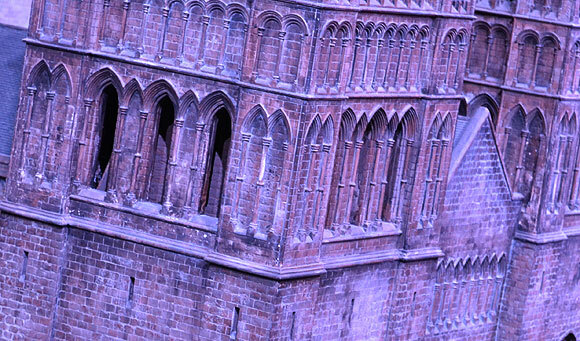 Yet nothing can prepare you for the intricate details evident in everything from the windows, doors, pathways and stone-like spires atop the medieval building’s imposing towers. For example, each individual brick, of which there must be a hundred thousand or more, is perfectly rendered, the stains of time and war giving each one character and vitality. 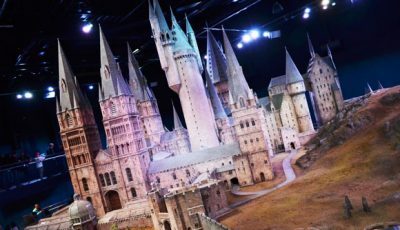 Jim hopes that those who don’t get the opportunity to see Hogwarts and other Harry Potter sets, costumes, concept art and props at the studio tour in London, will at least get a chance to see some of the detail on high-definition home video. 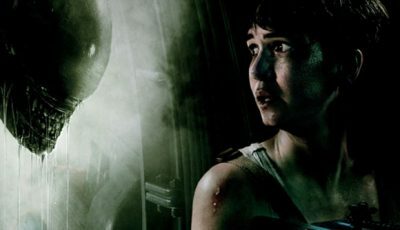 It does appear, however, the way modern film production is heading, that more effects will be created in the computer rather than in the workshop. This has meant Jim has become more focused on props than models. “With more digital work taking over, the model making departments are becoming less and less popular. Computers are also having a big impact on prop making. Some of that is down to digital enhancement in post-production but an increasingly popular process is computer numerical control (CNC) which is used for precision cutting amongst other things. “Getting things CNC’d is a growing method. Laser-cutting, water-jet cutting, CNC routing or getting things “grown” are options we now have. I am very much in favour of these techniques as it takes some of the repetitive builds away and gives you more time to get a better end result. “Good examples of this are when we draw up the prop on CAD (computer aided design) and separate any CNC parts and email those off, then make and mould the other parts. When the CNC items return you can then put it all together like a big jigsaw. “Using technology in the right capacity becomes a very good tool but you still need the skills and knowledge of good prop makers to make it all happen – so our jobs aren’t defunct yet. Jim’s latest venture is bringing his imagination and skills direct to your home. In between his time on film sets, Blue Print Jim draws on his experience, methods and technology to produce bespoke items for the home environment. Still in its early stages, current items include innovative key and post racks, coat hooks, and laser cut stainless steel film posters. See more of Jim McKeown’s work at his portfolio site here. You may also be interested in purchasing some of his bespoke household items at his newly launched Blue Print Jim shop. Blue Print Jim ships worldwide! Wow what an awesome job and what amazing work he has produced! Will check out his shop now! 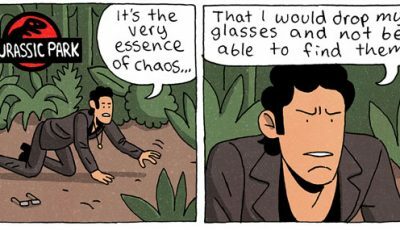 Fascinating work. How much I would give to be in this man’s shoes for a year! WOW, what a talented guy! What a dream job this would be… but very few people had THIS much talent! what posh work he has produced! Will check out his shop now!I would give to be in this man’s shoes for a year!